At Elan Bank of the Kerguelen Plateau in the southeast Indian Ocean, Leg 183 of the Ocean Drilling Program recovered clasts of garnet-biotite gneiss in a fluvial conglomerate intercalated with basalt flows. U-Pb and Pb-Pb dates of zircons and monazites in these clasts and an overlying sandstone range from 534 to 2547 Ma, which is much older than the surrounding Indian Ocean seafloor. These dates show that old continental crust resides in the shallow crust of the oceanic Kerguelen Plateau and that the breakup of Gondwana dispersed continental fragments into the nascent Indian Ocean lithosphere. 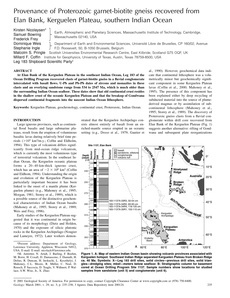 Kerguelen Plateau geochronology continental crust Proterozoic Indian Ocean.